A virtuosic display of clarinet playing in diverse electronic settings, Cigar Smoke provides an entertaining and extraordinary adventure in listening. Flamboyant improvisations along with exquistely notated scores comprise the action-packed CD. The title, Cigar Smoke, refers to the unfortunate incident in 1945 when famous Austrian composer Anton Webern went outside at night for a relaxing puff. The glow of the ash caught the attention of an American soldier who promptly shot the smoker dead. Well-planned composition did not die that night, however, and its descendants, now armed with laptops and ranks of loudspeakers are here to prove it. This collection brings together seven (mostly New York) composers who have each written demandingly flashy works for clarinetist Esther Lamneck and the modern equivalent of electronic tape. Lamneck has gigged with the likes of Pierre Boulez and has been called ï¿½an astonishing virtuosoï¿½ by none other than the New York Times. With this CD under her belt she is sure to go far. Lamneck directs the New York University Music and Dance Program and creates giant multi-media presentations in Italy. Esther Lamneck is one of the greatest clarinetists alive. That her name is not a household item is probably the result of her intense dedication to exploring the newest music of the most complex character, rather than the conventional repertoire, and her dedication to teaching new generations of students (at NYU) to play contemporary music. 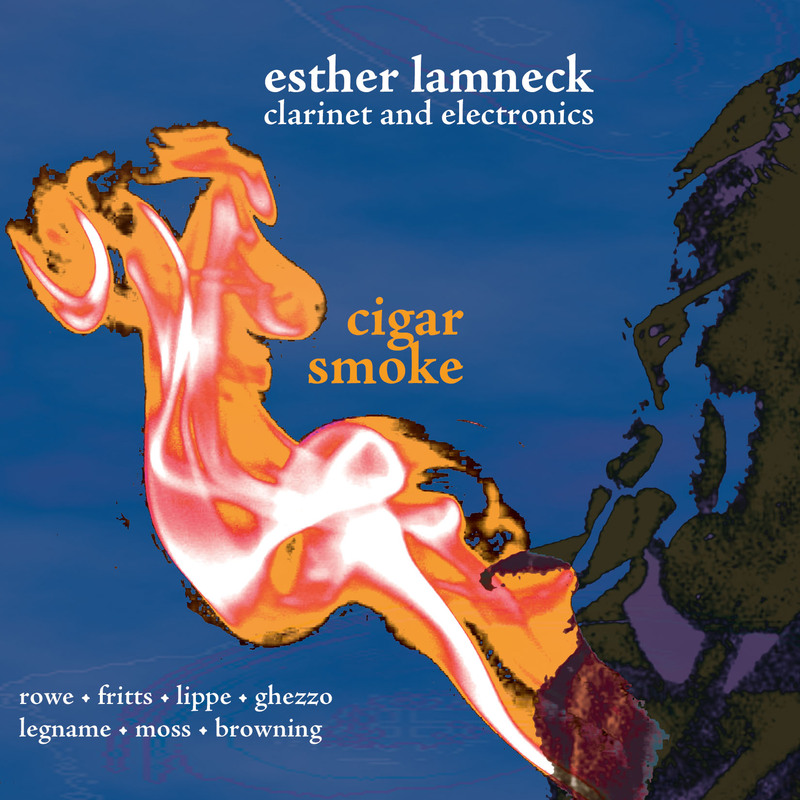 Her new CD on the Innova label, Cigar Smoke (Innova 673), brilliantly demonstrates her mastery of all aspects of clarinet technique in the musical context of solo clarinet and electronic/computer music. Ms. Lamneck was responsible for the creation of this music and gives amazing performances of all the works. They include: Cigar Smoke by Robert Rowe, Musicometry I by Lawrence Fritts, Trio for Clarinet and Two Computers by Cort Lippe, Abyss by Dinu Ghezzo, Event Horizon III by Orlando Legname, Lifelines by Lawrence Moss, and Crack Hammer by Zack Browning. The title track, Cigar Smoke alternates sections of composed music with cadenzas in which the clarinetist and the computer respond to each other interactively. The most interesting music in this piece occurs in the heterophonic textures created by the interaction between clarinet and computer. Musicometry I, incorporates recorded samples of Ms. Lamneck’s prior improvisations made at the composer’s request and direction. Particularly fascinating are the noise sounds made by the clarinet in the initial improvisation and incorporated into the computer music performed against the same sounds played against themselves by the clarinetist in performance. Trio for Clarinet and Two Computers is a three-movement work which uses two computers, one of which responds to specific improvised clarinet sound events and triggers independent computer music. It represents the most sophisticated use of technology on this recording. Abyss in seven sections, by Dinu Ghezzo, one of Ms. Lamneck’s NYU colleagues, is based on Milton’s dark theatre play Samson Agonistes. The piece carries an air of Eastern European melodrama (Mr. Ghezzo comes from Romania) and Ms. Lamneck improvises with great abandon here. It retains its emotional impact on repeated hearings. Event Horizon III explores the sound world of granular synthesis and is the most interesting piece sonically. The composer has incorporated extended clarinet techniques in a cadenza in the middle of the piece. Lifelines uses intricately interwoven lines between clarinet and electronic music. Particularly effective are Ms. Lamneck’s use of alternate fingerings to create timbre shifts and multipohonics. The tape part has some fascinating percussive timbres. Crack Hammer provides a welcome sense of fun and humor in an otherwise very serious CD. The composer employs repetitive, additive rhythms with an unpredictable sense of humor. The form and rhythm of this piece were based on a magic square. Ms. Lamneck’s impeccable sense of timing makes the performance very exhilarating. This outstanding recording (which was funded by the American Composers’ Forum’s Recording Assistance Program) should attract a lot of attention and provide Esther Lamneck (who also is a master of the Hungarian tarogato) some of the rewards she so richly deserves. .......the computer cultivates microtonal melodies for which Lamneck has a honed sixth sense- not conventional tuning with distortions, this is genuinely microtonal music.